There is beauty in simplicity. I feel that there is a common misconception that in order to make a statement, you have to go over the top or be extra. In my fashion-opinion, there is something to be said for finding ways to turn heads using the most casual pieces in my closet! Distressed skinny jeans are my weekend go-to. 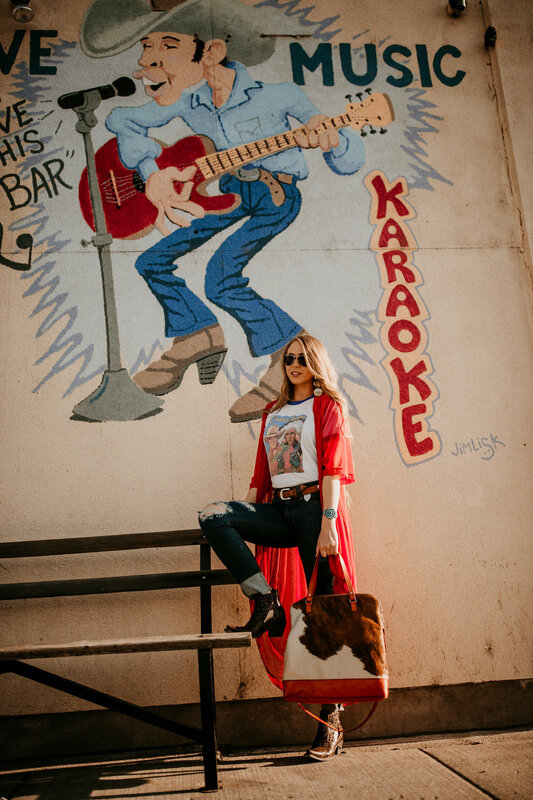 Whether I’m running errands, meeting my girlfriends for lunch, or even going on a last minute date night after spending all day with the horses, distressed skinnies can take an outfit from plain to show stopper with minimal effort. Kimes Distressed Bonnie’s are the perfect pair (with the perfect fit!) for all such occasions! These jeans create the ideal step one to creating the best simple-yet-bold outfit. Step number two: add a graphic tee! Seems like a pretty basic outfit to an outsider, but honestly graphic tees and distressed skinnies are the most versatile pieces you can work with! Not only does this create the perfect canvas for bold jewelry or colorful layers, but it keeps your look simple and timeless! Vintage or cowboy tees are my preference, but this is the step where you can choose a tee that describes your style without having to actually say a word. Third step: layer on finishing touches! With just a splash of texture from a hair-on hide purse and a statement color in this sheer duster, this once basic look is completely transformed! I decided to throw on some fun cut-out booties and stunner shades to create my final, fabulous look. Wanting to mix things up or take your outfit from day to night? Swap out the duster for a fall-ready sweater or jacket and layer on your best turquoise. 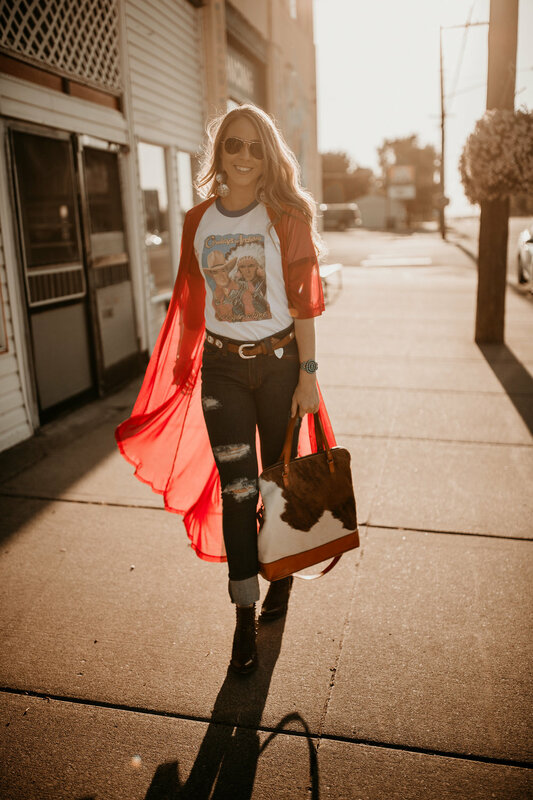 The options truly are endless with staple pieces like the Distressed Bonnie’s and a good graphic tee! With confidence in one hand and style in the other, this outfit is ready to take on the day and whatever it may bring! Want to shop our women’s collection?